She is joined on this early album by some wonderful musicians including her cousin, George Duke, Stanley Clarke, Billy Childs, Tony Williams, Freddie Hubbard, Herbie Hancock, Freddie Washington, and Paulinho da Costa. I am sure they saw the greatness, grace, and beauty back then that we see in her today. Whether she is scatting a joyous melody or chanting over an African rhythm, she does it with a style and finesse that come from deep within her soul. Her latest Blue Note release, A Little Moonlight, brought her another Grammy award for Best Jazz Vocal Album, which is her 3rd in a row. Grammy or not, it is a fine album. Both of these albums will set the mood for any romantic evening, even Valentine’s Day. 🙂 Enjoy your music. This entry was posted on Friday, February 13th, 2004 at 8:22 am. It is filed under Flashback Friday and tagged with Dianne Reeves, Flashback Friday. You can follow any responses to this entry through the RSS 2.0 feed. Okay, I have to admit I only have one CD of hers, and I have yet to see her in concert. I’ve heard you’ve been to two concerts, yes? Or is it more? I’m ashamed to say that I’ve only heard “the Grandma song” by Ms. Reeves. If I get a chance this weekend, I’ll see if I can buy some of her earlier stuff and will peruse the racks for A Little Moonlight. I love me some Dianne Reeves… check out my cd shelf when you get here. i love ‘better days’ i need to buy her cd ’cause i don’t have not one of them. You see…this is why I need to visit your site a little bit more. I love—no—ADORE Ms. Dianne Reeves! And am proud to say I own every last album she has released, and have seen her in concert at least six times! When it comes to vocal styling, grace, and emotion Dianne is at the top of my list. 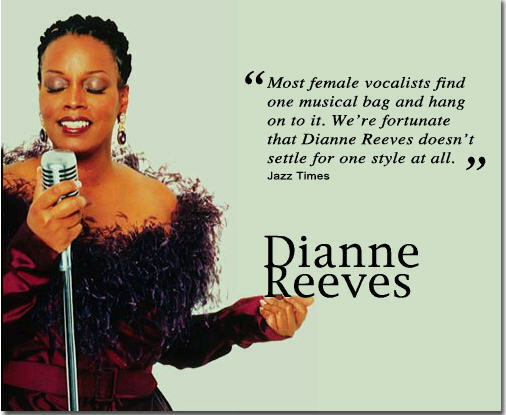 Dianne Reeves is one of the best vocalist I’ve ever heard. Her smooth jazzy voice cannot be matched. I think that Sky Island, one of her best recordings, cannot be touched by any other artist. Better Days is another example of her range and talent, she makes you feel as though You know her grandmother or that her grandmother bears a strong likeness to your own. When I driving my Corvette convertible, I lower the top and BLAST Sky Island. She is awesome.